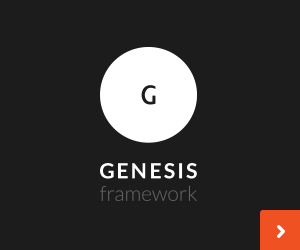 Recently I have been asked by a few web development clients to give them some ideas about where to look for Genesis themes for their websites. A couple of the website packages we offer at Cap Web Solutions allow clients to choose an existing theme to be implemented on their site with varying degrees of customization. I always send them first to the StudioPress Theme Selector page. Then I usually identify a few other top tier theme shops and pass along those links. I would go through the typical email copy-n-paste to assemble the lists and then I thought “someone must have already done this. Someone has already built a list of Genesis theme shops.” A tweak of my google search from ‘Genesis theme shops’ to ‘Genesis theme lists’ did the trick. A number of great lists were my reward. I went through a bunch of them, and, well, you know, I stayed near the top of the search results. Don’t we all? There right near the top was Andrea Whitmer. While she and I have never met face to face, we have had a number of “conversations” via comments on her blogs. I trust her. After all, she’s the one who calmed my fears about jumping on-board with the Genesis Developer Pro Package last year. And I am soooo glad I did. Anyway, I feel that I can trust her theme shop recommendations to pass them along, untouched, to my web development clients. So here it is. Andrea has assembled an awesome list of 3rd party theme developers. No doubt you will find something that coincides with your mind’s eye of what your site could look like. Disclaimer: Some of the off-site links referenced on this site are what is referred to as an affiliate link. If you choose to purchase or use the product or service through that link, I will get a small referral fee from the service or product provider. The price of the resource is the same whether or not you use my affiliate link.